The bus timetable featured psychedelic swirls, flowers and a definite sense of excitement. ‘Travel Route 60 style’ proclaimed the timetable. Time to get some flower power! I was getting the bus back to Cocking, partly because a two mile walk along the roadside verge didn’t exactly excite me, but mostly because there was no shop in Singleton so I needed to go up the road to buy myself a sandwich, which I duly did from the Cocking Post Office. 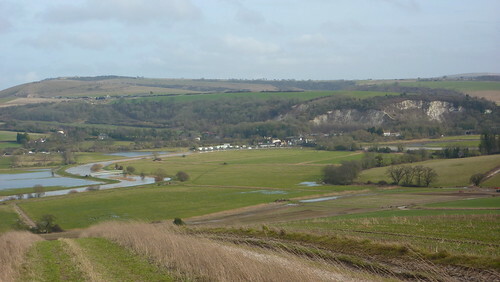 From there I intended to take a track which ran roughly parallel to the main road, and would deposit me on the South Downs Way about a quarter of a mile away from where I’d left it the day before. True, I’d be missing a short section, however it went mostly through farm buildings so I didn’t consider it to be a particularly great loss. Mind you, I had to find the track first. And not get distracted by shiny, interesting things. Oh. What’s that? An 11th century church just down this road? Don’t mind if I do! Bods’s Rule number 1 when walking – Bods will get lost even when doing exceptionally simple things. I followed the sign for the church and ended up in a distinctly churchless cul-de-sac. I followed a footpath sign, scrambled up an embankment and ended up walking round a farm field, before realising I’d now left the village and I had no idea where I was. With a sigh and some distinctively British tutting, I walked down a farm road which I presumed must go somewhere (it seemed like a guarantee) and found it did. It went back to the village and there was a church as well. It looked very nice. I walked on. 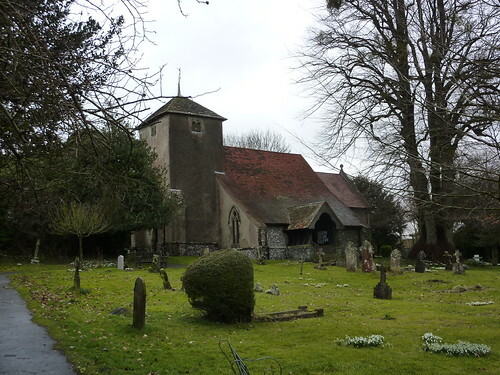 My map seemed to suggest that my required path left opposite the church, so I dutifully looked around, spotted a footpath sign and followed it, walking past an old woman walking her dog. Only to find myself stood right next door to the Post Office again. Tutting an estimated 10% louder, I retracted my steps and was thankfully spared the embarrassment of walking past the said same old lady thanks to the fact she was paying intense interest in the activities of her dog which was paused, leg cocked, on some scrub land. Spotting the correct footpath, I muttered a “Ah, there it is!” just in case she thought I was some sort of madman who wandered round villages in circles whilst wearing a heavy rucksack, and headed up the steep and distinctly muddy path up hill, taking in such exciting sights as an old, derelict barn, and a messy hedge. The excitement wasn’t over yet either. As I finally arrived back at the South Downs Way, I was treated to some of the worst smelling cow dung you’ll ever find. Still, at least there was a tap. True, I didn’t need any water. But there was a tap. How could I not get excited about that? All that fun and I hadn’t even been going for an hour yet. How on earth was I supposed to cope for the rest of the day? As it turned out, relatively easily. The Way took a path going gently up hill with a forest on one side, and some fields on the other. There were few views, until I walked past some sheep some time later. 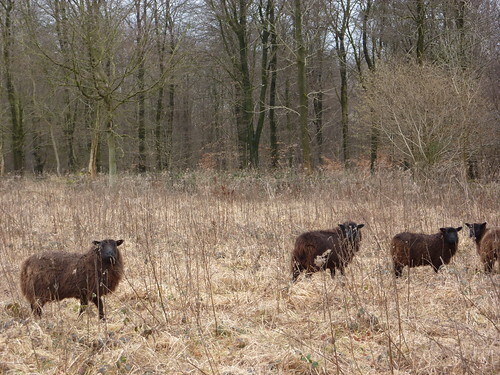 They were black and did that sheep thing of running away from you. Baaaa-my. 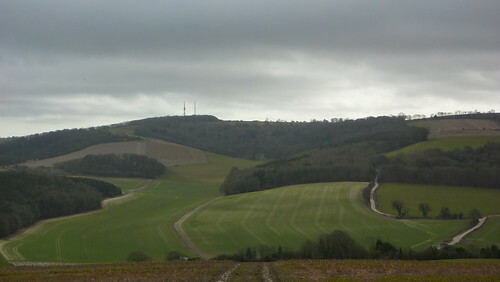 It was a rather gloomy day, and the heavy tree covering of Graffham Down didn’t particularly inspire much. The Way went down a tree lined path, with pens containing isolated patches of preserved downland. Eventually I came back out into the open, and was able to watch a pheasant nonchalantly walk across the path up ahead. Walking alongside a field, the edge was full of trees which had apparently been blown over in the 1987 hurricane winds which battered the South Coast. Rows of mighty wooden beasts lay slumped on the ground; their roots all pointing in the same direction. 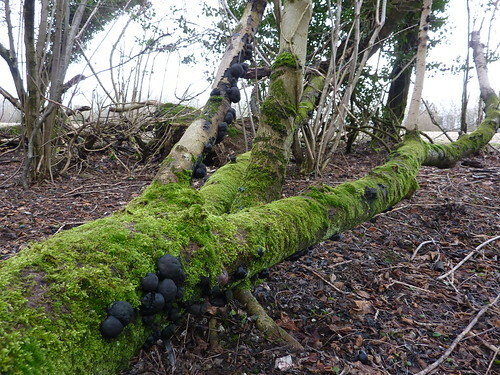 Black funghi had made the most of it, covering the damp wood. 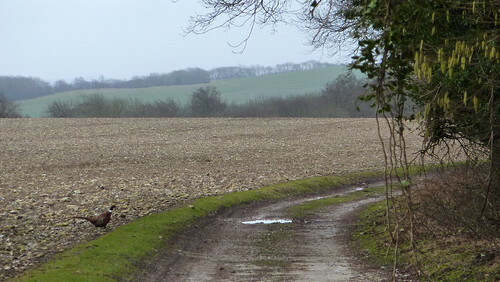 The path slowly got more open, however trees on the edges continued to obscure all potential of views until I finally popped out of the woods and entered farmland at Littleton Down. Having seen little of the area beyond, suddenly I was propelled into an area with a huge sweeping 180° panoramic view across the area. The rest of the day would now be more open, and would feature some more quintessential downsland walking and I strolled uphill towards Glatting Beacon – now home to mobile phone transmitters. I was now in the Slindon Estate, an area which Stane Street runs through. 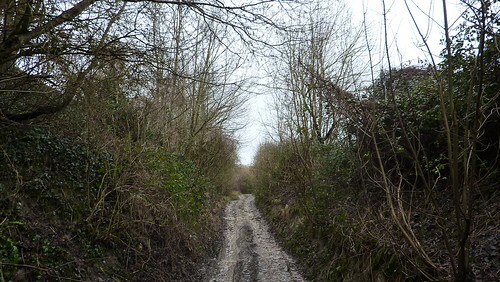 A Roman road which linked Chichester and London, the part I was on is now owned by the National Trust. 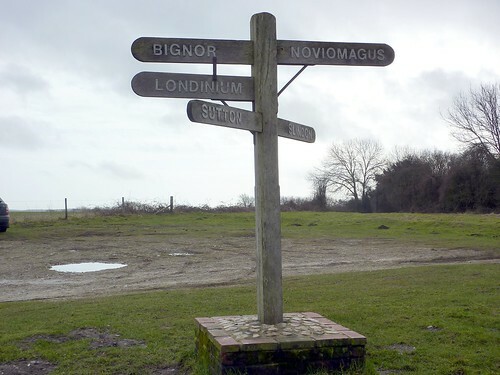 Sitting near a car park and a large signpost pointing to various Roman destinations (including Sutton), I ate my lunch and watched people come and go, including one family which seemed to do little more than park up, walk 10m to an information board before waddling back to their car. Their exercise quotient of the day clearly fulfilled, they quickly drove off. To say I was positively crowded out by people would be an exaggeration, however there were certainly a few people out walking, and I followed the South Downs Way along Bignor Hill, before turning off and heading back to isolation as paths took me alongside empty fields. Crossing over a busy main road, I got my first proper glimpse of Amberley, complete with the sight of a moving train in the valley. Huge, field sized areas of water filled my view – strangely absent from my map. 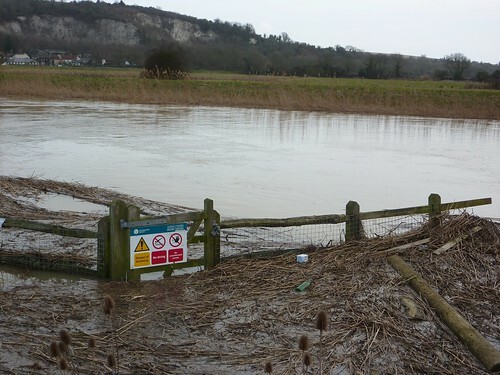 As I finally got down there, I saw the reason – the River Arun was clearly well over its normal waterline, with trees and gates giving an indication of how much. Thankfully the path was on a raised bank most of the way along the river although the final approach into Amberley required walking alongside a very wet path besides a flooded field. Crossing over the railway, I bade farewell to the South Downs Way for now and headed to the railway station for my return journey to London. It was only half two – it being a relatively easy day of walking. 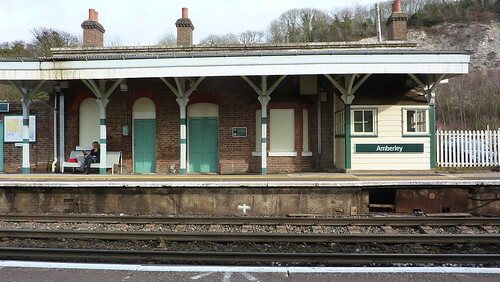 Amberley has only one train an hour, and I’d seen it go by as I approached the village. However my guide book politely informed me that there was a convenient pub near the station. As I neared, I proclaimed that if I arrived at the station with more than 45 minutes to spare, I’d go for a swift half. I’d arrived with 40 to spare. I mean, I’d done half the South Downs Way now! That’s worthy of a celebration! Coming soon, days 5 and 6! You can also view all the photos from day 4 on flickr, or see the full lot (such as it is currently). 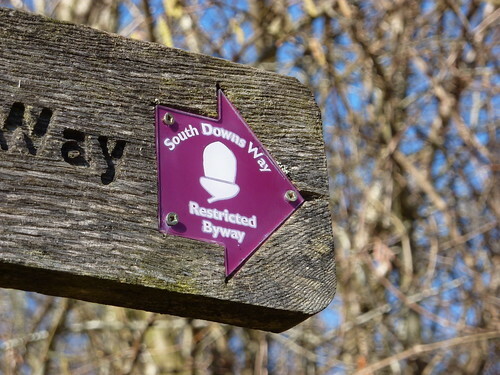 For goodness sakes Bods – have been following your peregrinations along the south downs way – am all agog and full of expectation… But here i am left stuck on Day 4. Where’s the rest got to?! Am full of admiration for this wandering abroad malarkey of yours – keep it up! Clive – afraid you’ll have to hang on a little longer! Just got back from trying (and failing, thanks to the weather) to finish the Pennine Way which we started in 2007 – hoping to do the end of the South Downs Way at the end of April with any luck! Oh, I forgot that I’d scheduled days 5 and day 6 to publish whilst I was away! Alistair and Jacquline – certainly would be interested to see the routes! We are currently doing the Sout Downs Way and each day before we take off we read your blog describing the stretch we are about to walk. Very informative and nice to read. First Published: 17 March 2010. Last Updated: 16 November 2014.